A good pie is a flaky crust filled with delectable filling and a side of ice cream. Once on masters the crust, and figures out correct volume for your particular pie pans, you are free to experiment and create new combinations of pies. But I truly believe, a good pie is all about the crust. I have done quite a few posts about pies – but still get frequent requests for my crust recipe. I have used the same crust recipe for a number of years now, one that my dad shared with me. I always use it, because it creates perfection. Why the vodka, you ask? My dad discovered the vodka crust method from J. Kenji López-Alt’s article in Cook’s Illustrated. The idea is, you are able to add more liquid to the dough, without making it tough by adding too much water. Most of the vodka bakes out and there is no after-taste. In a pinch I have used gin in place of vodka, and used bourbon once to make a fantastic bourbon apple pie. I am by no means pie scientist, I just do what I know works best – check out J. Kenji López-Alt’s Serious Eats article on pie myths for even more information on pies. I will have to test out the rubber spatula method on my next pie! 1. Preheat oven for particular pie recipe temperature. In a medium mixing bowl, use a pastry blender to cut in cold butter until pieces are coarse crumb size. 2. Sprinkle 1 tablespoon ice-cold liquid at a time, alternating water & vodka; gently toss with fork. Push moistened dough to side of bowl. Repeat using rest of liquid. Dough will be dry, do NOT give into temptation to make dough moister by adding more liquid, however, if it is unworkable, dry and crumbly, you may add 1-2 more tablespoons of vodka. Too much water will make your dough tough. Divide dough in half; form into a ball. 3. 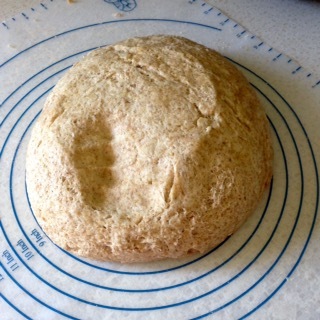 On a lightly floured surface, use your hands to flatten ball of dough. Roll dough from center to edges into a circle 12 inches in diameter. Do not overwork the dough and do not allow dough to warm up. Refrigerate while preparing filling, or if your baking time is delayed. If the dough is too warm, it will stick and tear. 4. Carefully transfer dough to pie pan, by wrapping around a rolling-pin, not allowing it to stretch. 5. Transfer filling into pie pan. Repeat steps 3 and 4 for second ball of dough. Gently drape second circle of dough over the filling. Use your fingers to seal the edges of the dough. 6. Optional: brush dough with milk and sprinkle with cinnamon and sugar. Cover edges in foil or with crust shield. Place piece of foil on bottom rack of oven, or pie drippings pan. Place pie in preheated oven, on middle shelf. Bake, according to filling directions. Crust is all about the right ingredients – like cold butter and cold vodka. I am always a big fan of organic butter. Crust is also all about the right tools: pastry cutter, marble rolling-pin, silicone baking mat, and crust shields. My first few pies were without these tools and it wasn’t impossible, but a little more frustrating to work without them. Sometimes I stack the fillings high, sometimes I keep my pies classic, and sometimes I mix and match the fillings. Following the correct volume, thickeners, and sugar amounts is important – once you have mastered the basics, any pie is possible. These two pies are strawberry-rhubarb and raspberry-rhubarb. My newest and most favorite pie tool is the silicone mat. I measured my pie pans and now never have the issue of a crust being too small and falling apart when I try to roll it larger. I still have the occasional small piece of crust is lop-sided and then a patch is needed. I never said my pies all looked like perfection – but taste is another story! See more about my must-have pie tools below. Depending on the pie, there can be a proper finish. For my double-crust fruit pies, this entails a brushing of milk and sprinkling of Demerara sugar. Sometimes cinnamon is also called for. A marble rolling-pin helps keep the dough colder while you are working with it. I refrigerate mine before rolling out the crust. I do not wash it with soap, just hot water. A silicone pie mat prevents sticking, helps with correct measurements, and makes cleaning up the countertops easier. A pastry blender works better for cutting in cold butter than a fork, but now I am intrigued with the idea of using a rubber spatula, and will be trying that next. King Arthur all-purpose flour is the only kind I use these days. The quality is top-notch and it never fails for all my baking needs. Unless I am baking gluten-free, and then I use Cup for Cup . I am still working on a perfect, from scratch gluten-free pie crust. I will let you know when I make the break-through. You may have noticed earlier in this post, that my pie shields are a tad on the small size. I may have to invest in these adjustable ones in the near future. A pie drip catcher means you are no longer wasting rolls of foil, trying to keep your oven free of the bubbling over pie fillings. I don’t believe in all the crazy sugar-fad items, but I sure do like the taste of coconut sugar. I will be trying this combination out on the top of my next pie! This time of year is exciting in the garden – the tilling, weeding, watering, and waiting has paid off and we are harvesting now. While my tomatoes are all duds, the plants have wilted and died, I do have some successes this year. The okra is flourishing – I planted Hill Country Red from Seed Savers Exchange in Decorah, Iowa. I love to make gumbo out of okra, I also think they would make beautiful stamping tools, when dried out. The two pumpkins – Pumpkin Musquee de Provence are growing rapidly. Right now they are about basketball-size and propped on top of pieces of block foam to keep them from rotting on the damp dirt. They should be a lovely dark mixture of green and orange when they mature. The kids are most excited about the prospect of growing one’s own pumpkin and are dreaming up ways to use it. I had two kale plants that survived the winter, thanks to leaf mulching, and being nestled against the south side of the house. They have once again absolutely exploded! You can see the size of the root from the mammoth kale that did not survive the winter, here. One of the other fun experiments this year, has been growing corn in the front yard. This is Japonica Striped Maize, an ornamental variety from Japan. As of the most recent count, we have five ears of corn. The kids have been delighted at watching the corn grow taller than them, and grow purplish tassels. I figure they will make great autumn decor, or still life subject matter for my classroom. One of my favorite things this year, has been watching my volunteer squash grow. These two came from seeds in our compost, so I am not entirely sure what they are yet. I think the white one is possible a white acorn squash and the green is a zucchini. We will wait and see! Iowa Skies, watercolor, 9×12″, 2016. My most recent finished watercolor, started just before our trip to Alexandria, MN – based on an Instagram photo I took a few years ago of baby blankets drying on the clothesline. This summer has been flying by – we have all been making time for creating which leaves me happier than anything else at the end of the day. As I write this, my youngest is throwing chalk and making the best 2-year-old smears of color that he can make. Last week, Greta had her school friends over for a belated birthday celebration, so we whipped up a quick Batman piñata. The two kids worked on their own cardboard and tape creations, while adding layers of paste and newspaper when they felt like helping me. Batman’s head was formed from a large balloon. The ears and nose were fashioned from cut up cereal boxes, which were then layered in papier-mâché strips. My favorite paste for papier-mâché projects is art paste, it comes in a powder and when mixed with water, makes a gel-like paste that isn’t too sticky and lasts well, when covered. Batman, dried and waiting to be painted. The finished painted Batman. This was a quick, get it finished paint job, as I was finishing the paint 1 hour before the party. Nothing like a deadline to get an artist moving! A couple of weeks ago, we headed North to Alexandria, Minnesota, with my hubby’s family. We rented a wonderful lake house with a boat, playground, and killer lakefront view porch. We spent our time boating, fishing, eating, playing games after the kids were in bed, swimming, and site-seeing. It was a lovely way to spend a week in the summer! We broke up the 7+ hour drive with a stop in Minneapolis, to see my sister, brother-in-law, and niece both times. A big backyard with a sandbox and a wading pool were a welcome view to my stir-crazy, stuck in the car, kids. Upon arriving at the lake, all cousins immediately jumped on the boat, and proceeded to giggle and goof off. I absolutely love this image – it captures their silly attitudes and sheer joy at being on a boat, perfectly. As it grew dark, the dads and kids went for a breathtaking (literally) swim. I opted to take photos, and wished I had brought my own wetsuit. I am a chicken when it comes to swimming in really cold water! I was pretty excited to have this view for the next week, and settled right in to work on a watercolor painting that I had started a day before. We found some of the most beautiful biking scenery we’ve seen in a while, on the snowmobile trails that traverse the entire area. There was seriously no one on this trail with us, save for a strange encounter with one lone cyclist, I will spare you the details on that story. We saw snakes sunning themselves, sandhill cranes calling to one another, turkeys strutting across the trail, and wildflowers in bloom. We biked from Alexandria to Osakis which proved to be a good find. We found a Scandinavian shop, Jacob’s Lefse Bakeri, that sold honest to goodness lefse – made in the back room! I was in heaven and bought a package to wolf down with the two older girls. We also decided on lunch in a small diner on the main street, which proved to be a blast from the past. I could almost hear my grandfather’s stories of the neighbors, and other gossip over the clink of coffee mugs, and lovely Minnesota accents. We found a fabulous set of museums in Alexandria. Our favorite was the Maritime Museum, which housed quite the collection of Chris Crafts and other antique boats, an interesting Gyotaku (fish print) exhibit, and gardens outside. We drove to Inspiration Peak and made the short hike to the top, only to find ourselves wading through ants, so we snapped a few pictures and headed back down quickly! The kids loved being able to see for miles and didn’t want to look at me for this picture. It wasn’t all just boating and swimming time – we did do quite a bit of fishing. These were two of my favorite views of the trip – oh how I love being on and near water. On our last day, we found ourselves a petting zoo and pony rides in Osakis for their Osakis Days summer festival. The kids were beyond delighted to do a few laps around on Princess and Nugget. On the last night, we used up leftover food and make kitchen sink nachos to go with brats, potatoes, and other sides. I absolutely loved sitting and eating meals on that porch, overlooking the water. We enjoyed one last cloudy fishing outing before heading back to warmer Iowa and the work week (for the non-teachers). Lake time was exactly what we needed to kick off our summer vacation. This past week I got inspired by a beet recipe, Balsamic-Glazed Beets with Pecans, from Eating Well magazine. We have been receiving lots of beets from our weekly produce box and I get tired of making things over and over again the exact same way. 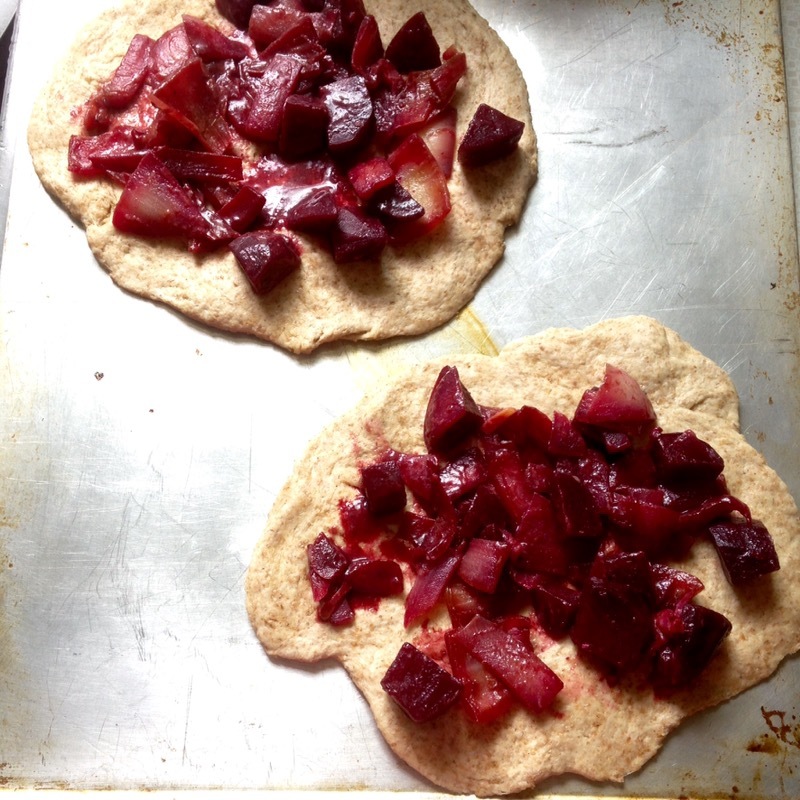 I decided that this beet recipe would be the best pizza topping on earth. So, I mixed up a double batch of my best.pizza.crust.ever, however, this time I used 1 cup of whole wheat flour and 2 cups of all-purpose flour. It was a nice whole grain taste, without being too dry. By the way, the Norpro silicone pastry mat (above) gets used all the time in my kitchen – it is perfect for kneading, rolling dough, and measuring the size. I glazed the beets the day before, but also added a small yellow onion to the Eating Well recipe. I added an extra tablespoon of balsamic vinegar to make sure it was saucy enough for a pizza topping, as I was not planning on using tomato sauce for the beet pizza. I left off pecans, due to personal preferences in my household, however, I would add them were I making this just for myself! I like to make amoeba-shaped pizzas – they are more interesting to look at. I topped the beet pizzas with crumbled goat cheese, sliced jalapeño peppers, and sliced beet greens. I made 6 pizzas total, out of whatever veggies we had laying around. These were the perfect kitchen sink pizzas. Pizza on left: tomato sauce, pizza seasoning, sliced sweet peppers, sliced swiss chard, and crumbled feta cheese. Pizza on the right: tomato sauce, pizza seasoning, sliced grape tomatoes, sliced shallot, beet greens, and crumbled feta cheese. The last pizza was for the kids and topped with: tomato sauce, pizza seasoning, sliced sweet yellow peppers, and grated cheddar cheese. I baked all pizzas at 425° for 14-17 minutes, or till cheese was melted. All of these pizzas were delectable – but the beet pizza was by far my favorite. The combination of vinegar, beets, onion, crispy greens, soft goat cheese, and chewy crust was perfection. I will be making this again, with my next batch of beets!